In this haunting photograph, one of a series of four (2005.44.2, 2005.44.3, 2005.44.4), artist David Wojnarowicz had himself photographed around New York with a mask of the French symbolist poet Arthur Rimbaud, who is most famous for his poem cycle, A Season in Hell. Like that of Rimbaud, Wojnarowicz's early life was characterized with alienation from society and family, with a period of living on the streets, a young person dealing with being gay in an overtly hostile environment. In this project, the scenes depicted are the New York locales Wojnarowicz frequented in this period of homelessness and drug abuse. The figure in these scenes is shown standing eerily alone in his own world, despite the presence of people around him. 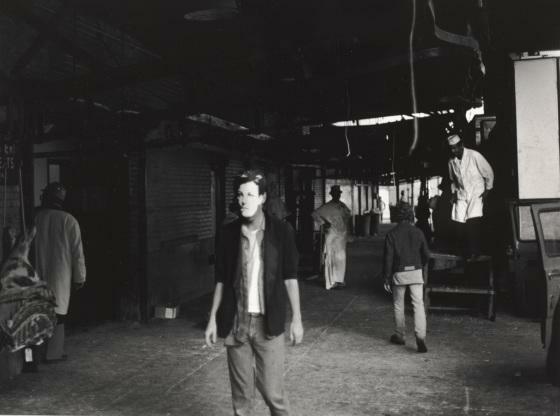 Wojnarowicz's photographs simultaneously demonstrate the ability of photography to both create stories and to investigate how society and the media have long used the creation of images to tell stories in service of their own agendas. Considered on their own, these four photographs are at once, paradoxically, documentary evidence and narrative set up; they record a life both vividly imagined and intensely lived. Anna Katherine Brodbeck, ed., TWO X TWO X TWENTY: Two Decades Supporting Contemporary Art at the Dallas Museum of Art (Dallas: Dallas Museum of Art), 2018, 76-77. Read more about the life and work of David Wojnarowicz.